The Yahoo! 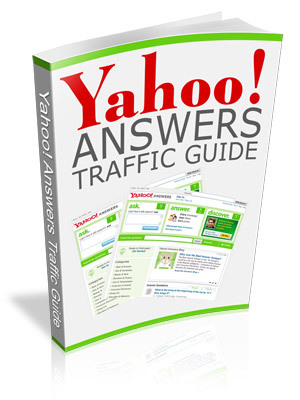 Answers Traffic Guide will make it easy to launch a blog or website at no cost! Direct traffic to ANY page you wish within seconds – No waiting days for results! We will take you step by step through the entire process from creating your account to generating traffic to ANY page you desire within minutes. How to be the first to answer questions – every time! Get selected as the "Best Answer" time and time again! How to build up your levels quickly to enjoy unlimited access to new questions. How to locate specific niche related questions that you can use to target visitors in your specialized categories and topics. How to generate high quality traffic to your pages and avoid time-wasters! Send organic, active visitors to your website who are begging for more information! How to use Yahoo! Answers to build your websites, locate hot topics, and conduct market research easily. Want to know what Internet users are looking for information on? It doesn't get easier than this!